The Glaslyn female spent a wet and miserable night on the nest last night. 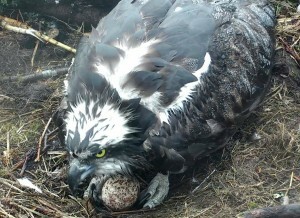 She incubated the egg from just after 8.20 p.m. when the male left the nest. Throughout the night she turned the egg regularly. Just once did she stretch her wings for a few brief moments. Then it was back to incubating again. The photo was taken early this morning. More to follow later……..all is well.